Breakfast for dinner! 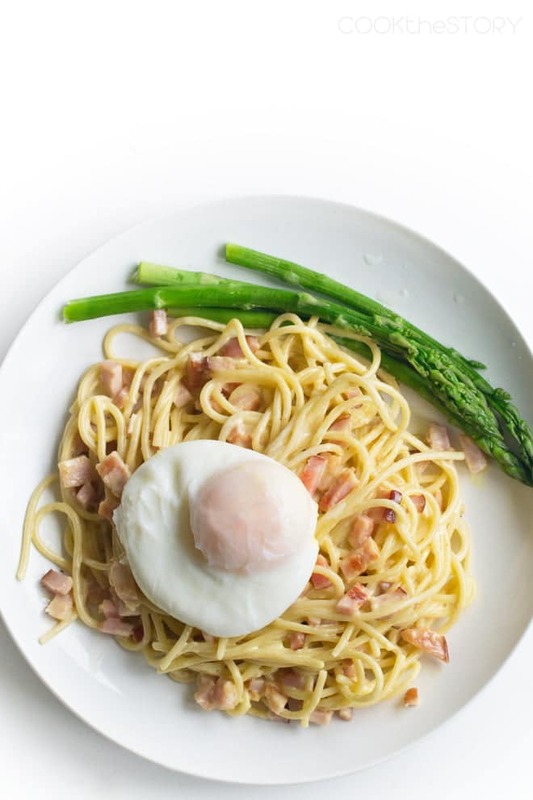 For this quick and easy dinner, Eggs Benedict gets a pasta makeover. It’s too delicious to believe. We’ve talked a lot about Eggs Benedict lately. We’ve covered how to make a really easy hollandaise sauce, how to poach eggs perfectly and how to put everything together to make Eggs Benedict for a crowd. I also gave you an idea for what to do with leftover hollandaise sauce; this Hollandaise Butter is insanely good. Today I have one more idea for leftover hollandaise sauce. It’s Eggs Benedict Spaghetti! It’s such a delicious dish that you might make a batch of hollandaise sauce just for it. Pin this to your Breakfast-for-Dinner Board! It’s basically spaghetti noodles tossed with hollandaise sauce and then topped with a poached egg. 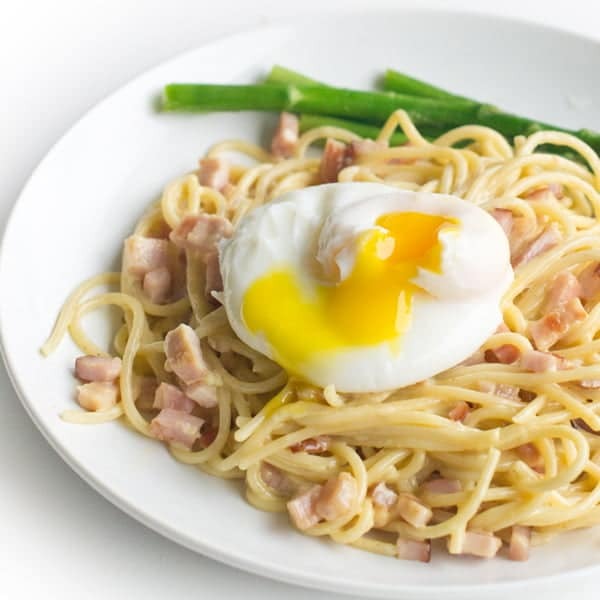 When you break open the poached egg, the yolk drizzles over the spaghetti and mixes with the hollandaise sauce. 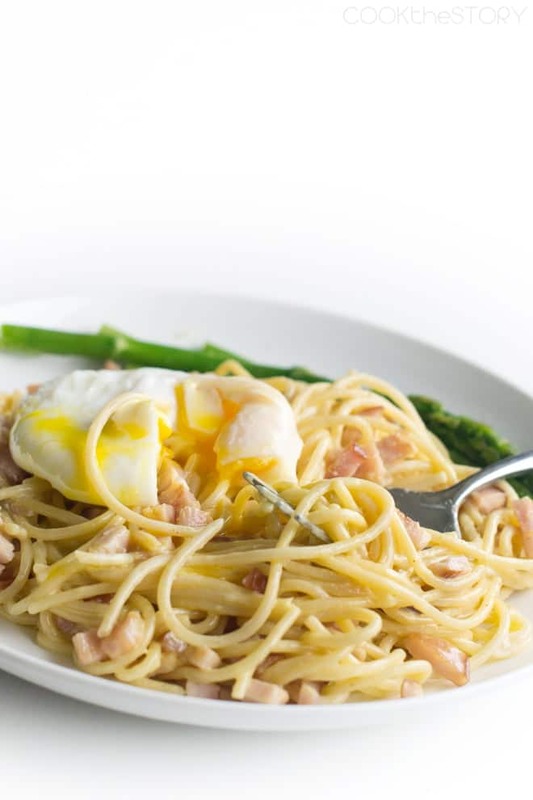 It’s a little bit like spaghetti carbonara, but much richer and has a touch of zest from the lemon in the hollandaise sauce. You’re going to love how easy this dinner is to make. Cook up some spaghetti. While it’s simmering fill another pot with water and bring it to a boil for the eggs. You’ll be poaching your eggs right before serving (unless you poached them ahead of time in the way I explained here). Chop some Canadian bacon and let it sizzle in a pan. Get out your leftover hollandaise sauce. Or whip up a batch. It’ll only take a couple of minutes. Promise. Drain the spaghetti, reserving some of the cooking liquid. You’ll need this to add to the final dish. When the pasta and sauce are ready, poach your eggs. To put it all together, toss the hot spaghetti with some hollandaise sauce and add just a little of the reserved cooking liquid. Sprinkle with the fried Canadian bacon. Divide among plates and top each serving with a poached egg. Or two. I just love how easily this breakfast becomes dinner, don’t you? And just look at all that messy tasty food on the plate! Cook the spaghetti according to package directions but before draining the pasta scoop out a few tablespoons of the cooking liquid. While it cooks, put on a pot of water to boil and then reduce it to a subtle simmer (this will be for poaching the egg later). Heat a small frying pan over medium heat. Add the Canadian bacon and cook, stirring occasionally, until lightly browned in spots. Remove from heat. Set aside. After draining the pasta, poach the egg in the simmering water. Here's a great method for poaching eggs. 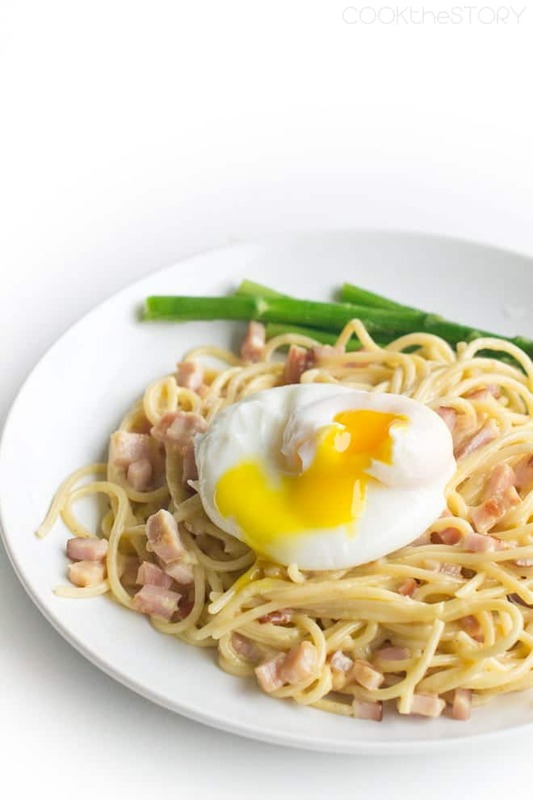 Toss the hot spaghetti with the hollandaise sauce and the bacon. Add a dribble of the cooking liquid. Add enough to make the sauce moist and silky. 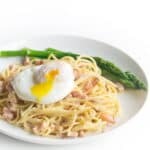 Put the spaghetti on a plate and top with the poached egg. You are speaking my love language!! Such a fun twist that resembles spaghetti carbonara. Creative that you used eggs benedict for it. You had me at eggs benedict, and pasta! This looks amazing!